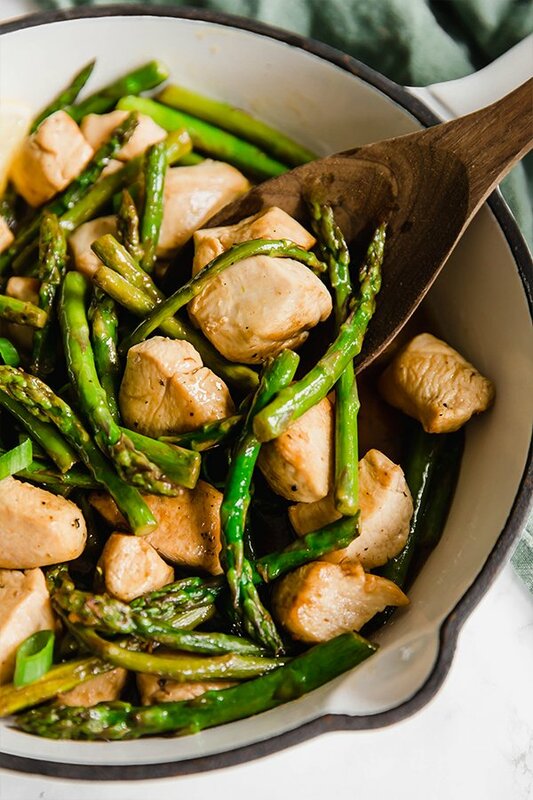 This lemon & asparagus chicken skillet is a simple one-pan meal to make on a weeknight or for meal prep. It’s Whole30, Paleo, AIP, and gluten-free. Sometimes you just need an easy one pan meal! I love cooking skillet meals on busy weeknights or for simple meal prep. It helps keep dishes at a minimum and can reduce overall cooking time. I never really took advantage of one pan meals until I started blogging, and now I can’t get enough of them. 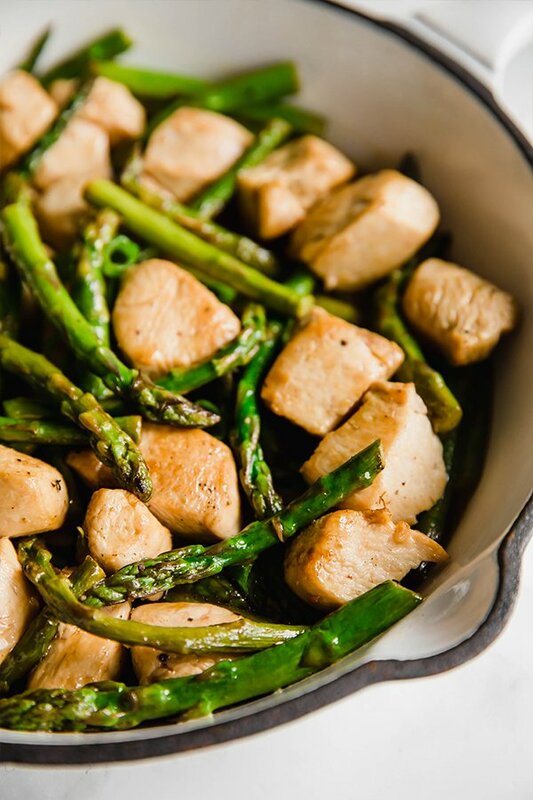 There are so many possibilities for what you can make in one pan, and this lemon & asparagus chicken skillet is a light, fresh and flavorful option. This one-pan meal comes together in under 45 minutes and uses seasonal ingredients like asparagus, and easy to find protein like chicken breast. It features lemon juice to give it a kick of acid, and just a bit of coconut aminos to give a bit more umami. Plus, this meal is allergen friendly and is made without any of the common allergens. It’s paleo, whole30, and AIP compliant, and great for sharing with family or friends who have gluten, dairy, or soy allergies. Either chicken breast or thigh will work for this recipe, but I like using chicken breast! Simply cube it up and you’re good to go. This helps it cook a bit faster, and make the meal easier to eat on the go. Asparagus is really simple to prep and store. What I like to do to store it is to place the bottom of the spears in a mug or glass cup and fill it with about half an inch of water. This helps keep the asparagus fresh and crisp! I’ve had success with keeping it like this for 3-4 days. From there, you want to cut off about an inch of the thicker base of the spears. With this recipe, you’ll cut them in half, but you could easily roast them whole in other recipes like this. You can leave out the pepper if you’re AIP, but these flavors help round out the dish. The flavor of lemon and asparagus pair really well together, and I love how it tastes in this dish. It’s light while still adding a kick with the acid. Fresh lemon juice works best, but refrigerated will work as well. These make a light sauce to add more flavor to the dish and keep it from being dry. The coconut aminos is a soy sauce substitute, and the arrowroot starch works to help thicken the sauce. Using a large skillet, heat the avocado oil on medium heat. Add the chicken to the skillet and lightly season with salt and pepper. Cook until the chicken reaches an internal temperature of 165 F. Set aside. Prepare the asparagus by chopping off the thick white base, and then slice in half again. Add more oil to the pan if needed and saute the asparagus with more salt and pepper for about 5-7 minutes or until softened and lightly crisp. Set aside. Reduce the heat slightly and add the minced garlic to the pan. Cook until fragrant. Add the broth, lemon juice, coconut aminos, and arrowroot starch to the pan and stir for about 2-3 minutes or until the sauce lightly thickens. Add the chicken and asparagus back to the pan and cook for another 2 minutes to reheat. Serve topped with green onion and season further to taste. All nutrition facts are an estimation and not exact. The photos of this recipe and all written content on my website are copyright protected and cannot be copied or shared. Please do not copy this recipe or photos and share it on your own website, Instagram, or other written materials. If you’d like to feature a photo in a roundup, please contact me. If you’d like to tell people about this recipe on social media, your own website, or elsewhere please link back to the recipe here rather than copy and pasting. Thank you so much!! Thanks, Elena! Hope you love it! !